Do not let the band name fool you. This is not a "go outside in the jungle and beat on a log with sticks for spiritual salvation" kind of album. Far from it. This is a "be subtly influenced by organic rhythms and waves of sound for pure satisfaction" kind of album. 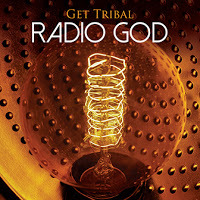 Admittedly, the music has its roots in shamanism and drumming, but the music on Radio God is more refined than the norm. The rhythms are aurally mesmerizing and the compositions more intricate than mere pounding and cooing. This is a reimagining, perhaps even a modern reincarnation of the ancient Kirtan experience of meditation melded with electronic music. Get Tribal is the brainchild of musical visionary Kari Hohne. A curriculum vitae would take up the rest of the review, so suffice it to say Kari identifies with sound on a sub-atomic level that reaches deep into the spiritual. That is what makes her music so amazing. Radio God is ten tracks of World, New Age, Electronic and Sacred music that satisfies the body as well as the spirit. The first cut is called Guip (Sunrise). What starts out with a semi-classical piano lead eventually exhibits a metamorphic change into beat driven blues. Contained within is an understated East European dance vibe that just skirts the obvious. Ruah (Breathe) is from the Hebrew, a term for breath, but it is much more. It is the miraculous force that gives life. Get Tribal uses the theme for a wonderful piece that is part cinematic, part allegorical. The breath of life sweeps over the planet, giving birth to all living creatures, plants, animals, and mankind. The music says "witness this". Taba (Out of the Underworld) is an intrepid piece. Ereshkigal, ruler of the underworld judges you worthy to enter, but can you leave? This is the music of a journey through darkness and within a labyrinth of sharp rocks and bottomless drops. Is that a light I see up ahead? Koek (The Gift of Fire) is offered to everyone in Native American legends. This tune had a delightful cadence of percussion with the ballad. It has surprising Celtic undertones in the intro. The ideology of Native Americans has always been based of sharing, whether it be fire, peace or the land. Just take what you need and no more. Kshen (Remove the Red Dust) is the sound track for the exploits of a drunken dragon. Honestly, this funky Chinese ditty is fun to tap you toe to with its bass groove and Asian tinged melody. It invites you travel down the road of Eastern history. Kved (At One with the World) is suffused with organic Vedic Chant and an electronic refrain that would seem counterintuitive until you listen to it a few times. It begins with a brilliant guitar riff and then segues into something ancient and contemporary. The two worlds vie for spiritual grace. They are resting on the same plane after all. If this be the child of English Glam and Kirtan elements, then I say watch the growth of this child closely, nourish her and let her flourish. There is something about these ten tracks of organic and electronic rhythms that make them inherently pleasing on levels we cannot even perceive. At least I can not.